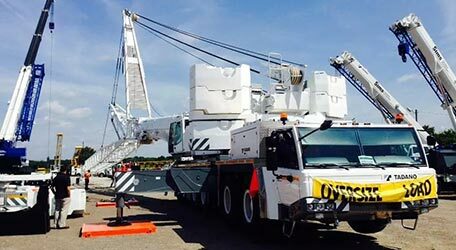 Sims Crane & Equipment is the only name to trust when you need industrial construction equipment, service, parts, and more. We stock a wide selection of hoist elevators, tower cranes, mobile cranes, all-terrain cranes, and a variety of other equipment in each of our 13 Florida locations, and we have been serving the needs of Florida builders for 60 years. Sims Crane & Equipment is known for being an outstanding crane company, but we also provide our customers with a wide range of other industrial equipment to help them get their jobs completed on time, including hoist elevators, forklifts, and more. Our hoist elevators, or material hoists, are designed to make lifting heavy materials a breeze. With easy setup and assembly, you can quickly transport heavy loads of tools and other materials overhead where you need them. Always keeping safety top of mind, each of our hoists is built to be durable and reliable, and we have options with varying capacities to meet a broad range of project specifications. Additionally, we are sticklers for maintaining our top-quality equipment, and each piece of equipment in our fleets is regularly maintained and inspected for quality assurance. We know downtime on construction sites costs you money, and we work hard to ensure that our equipment won’t break down on the job. Material hoists, along with most of our equipment, are available for sale or daily, weekly, monthly, or Flex Time rental periods. Whatever you need, we can help! Sims Crane & Equipment gladly serves West Palm Beach, as well as other locations statewide, so if you need hoist elevators, crane rentals, lift planning, or have any other industrial equipment needs, contact us today!